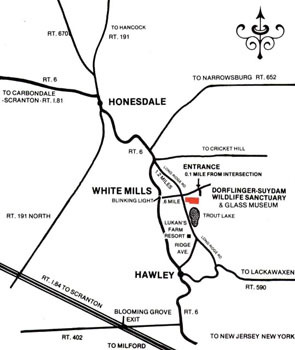 The village of White Mills lies halfway between Hawley and Honesdale on Route 6. At the blinking light adjacent to the White Mills Hotel in White Mills, turn and go up the steep hill (Elizabeth Street) for 6/10 of a mile to the stop sign at a second blinking light. Continue on for 1/10 of a mile to the entrance of the Sanctuary on your right. Do not rely on your GPS. There are database errors in some systems and users are not always directed to the correct location. If you plan to use a GPS or internet mapping software, please compare your directions to those found on this page and use the following address. At Scranton, take I-81 North to JCT I-84/I-380/US 6. Bear LEFT onto off-ramp at Exit 187 to US Route 6 East (Gov. Robert P. Casey Highway). Expressway ends, but continue on Route 6 East through Waymart and Prompton. At traffic light in Honesdale, turn RIGHT ONTO Main Street (Route 6 East/Main Street), then LEFT at next traffic light (staying on Route 6). Continue on Route 6 East past the Route 6 Shopping Plaza and McDonalds to the village of White Mills. In White Mills, turn LEFT at the flashing light and go UP the steep hill for half a mile to the stop sign. Go straight through the intersection. The entrance to the Dorflinger-Suydam Wildlife Sanctuary on the right. Take I-80 West across the Delaware River (Dover/Delaware Water Gap). In Pennsylvania, continue on I-80 West (toll required for some segments) for app. 45 miles to Exit 309, US-209 North. Continue on to US-209 to PA-402 North to Marshall’s Creek. Continue on Route 402 until junction of US Route 6. 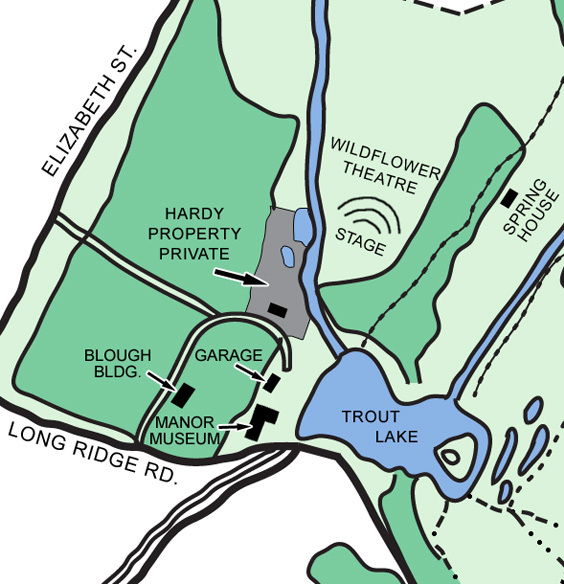 Turn LEFT on Route 6 West and continue past Lake Wallenpaupack and through the town of Hawley. At The Settlers’ Inn in Hawley, make a sharp LEFT turn to stay on Route 6 West. Stay on Route 6 to the village of White Mills, approximately 4 miles past The Settlers Inn. In White Mills, turn RIGHT at the flashing light and go UP the steep hill for half a mile to the stop sign. Go straight through the intersection. The entrance to the Dorflinger-Suydam Wildlife Sanctuary on the right. Take PA 28 North (or I-79) to I-80 East for app. 180 miles. At exit 260B (on left), merge onto I-81 North toward Wilkes-Barre. Continue on I-81 North to JCT I-84/I-380/US 6. Bear LEFT onto off-ramp at Exit 187 to US Route 6 East (Gov. Robert P. Casey Highway). Expressway ends, but continue on Route 6 East through Waymart and Prompton. At traffic light in Honesdale, turn RIGHT onto Main Street (Route 6 East/Main Street), then LEFT at next traffic light (staying on Route 6). Continue on Route 6 East past the Route 6 Shopping Plaza and McDonalds to the village of White Mills. In White Mills, turn LEFT at the flashing light and go UP the steep hill for half a mile to the stop sign. Go straight through the intersection. The entrance to the Dorflinger-Suydam Wildlife Sanctuary on the right. Take the Northeast Extension of the Pennsylvania Turnpike (I-476 North) to the Pittston exit (JCT with I-81 North). Follow I-81 North toward Scranton to JCT I-84/I-380/US 6. Bear LEFT onto off-ramp at Exit 187 to US Route 6 East (Gov. Robert P. Casey Highway). Expressway ends, but continue on Route 6 East through Waymart and Prompton. At traffic light in Honesdale, turn RIGHT ONTO Main Street (Route 6 East/Main Street), then LEFT at next traffic light (staying on Route 6). Continue on Route 6 East past the Route 6 Shopping Plaza and McDonalds to the village of White Mills. In White Mills, turn LEFT at the flashing light and go UP the steep hill for half a mile to the stop sign. Go straight through the intersection. The entrance to the Dorflinger-Suydam Wildlife Sanctuary on the right. Take I-90 West to I-84W/US-20/Harford/NYC. Take I-84 West through Hartford, Connecticut and continue through New York state. I-84 crosses the Hudson River at Newburgh, New York (TOLL). Continue on I-84 West. Enter Pennsylvania at the town of Matamoras. Stay on I-84 West to Exit 30 (Blooming Grove//Porters Lake). Get off on Exit 30 and turn RIGHT at the end of the ramp on to PA Route 402 North. You will pass a State Police barracks on the right. Continue on Route 402 until junction of US Route 6. Turn LEFT on US Route 6 West and continue past Lake Wallenpaupack and through the town of Hawley. At The Settlers’ Inn in Hawley, make a sharp LEFT turn to stay on Route 6 West. Stay on Route 6 to the village of White Mills, approximately 4 miles past The Settlers Inn. In White Mills, turn RIGHT at the flashing light and go UP the steep hill for half a mile to the stop sign. Go straight through the intersection. The entrance to the Dorflinger-Suydam Wildlife Sanctuary on the right. From top level of the George Washington Bridge, take I-95 to I-80 West to New Jersey Exit 34B to Route 15 North (Jefferson/Sparta). Route 15 North becomes Route 206 North. Continue to bridge (TOLL) across Delaware River and onto US-209. Stay straight onto Route 6 West through Milford. Continue on Route 6 West past Lake Wallenpaupack and through the town of Hawley. At The Settlers’ Inn in Hawley, make a SHARP LEFT turn to stay on Route 6 West. Stay on Route 6 to the village of White Mills, approximately 4 miles past The Settlers Inn. In White Mills, turn RIGHT at the flashing light and go UP the steep hill for half a mile to the stop sign. Go straight through the intersection. The entrance to the Dorflinger-Suydam Wildlife Sanctuary on the right. From the Tappan Zee Bridge, Head west on I-287 W/I-87 N. Take exit 13N for Palisades Pkwy N toward Bear Mtn. Merge onto Palisades Interstate Pkwy. Take exit 18 on the left toward US-6 W/NY-17/I-87. At the traffic circle, take the 2nd exit onto US-6 W. Take the ramp onto NY-17 W/US-6 W. Take exit 123 to merge onto New York 17M W/Route 17M W/State Route 17M W/US-6 W toward Middletown/Port Jervis. Continue on I-84 West to Exit 30, PA-402 (Blooming Grove/Porters Lake). Turn right onto PA-402, then left onto Route 6 West. Continue on Route 6 West past Lake Wallenpaupack and through the town of Hawley. At The Settlers’ Inn in Hawley, make a SHARP LEFT turn to stay on Route 6 West. Stay on Route 6 to the village of White Mills, approximately 4 miles past The Settlers Inn. In White Mills, turn RIGHT at the flashing light and go UP the steep hill for half a mile to the stop sign. Go straight through the intersection. The entrance to the Dorflinger-Suydam Wildlife Sanctuary on the right. Take I-83 North to exit 51B to I-81 North toward Wilkes-Barre. Continue on I-81 North to JCT I-84/I-380/US 6. Bear LEFT onto off-ramp at Exit 187 to US Route 6 East (Gov. Robert P. Casey Highway). Expressway ends, but continue on Route 6 East through Waymart and Prompton. At traffic light in Honesdale, turn RIGHT onto Main Street (Route 6 East/Main Street), then LEFT at next traffic light (staying on Route 6). Continue on Route 6 East past the Route 6 Shopping Plaza and McDonalds to the village of White Mills. In White Mills, turn LEFT at the flashing light and go UP the steep hill for half a mile to the stop sign. Go straight through the intersection. The entrance to the Dorflinger-Suydam Wildlife Sanctuary on the right.